A Democrat running for Congress in Colorado who touts his work on behalf of veterans missed 35 percent of the Colorado Board of Veterans Affairs' meetings while he served on that body, according to meeting minutes. 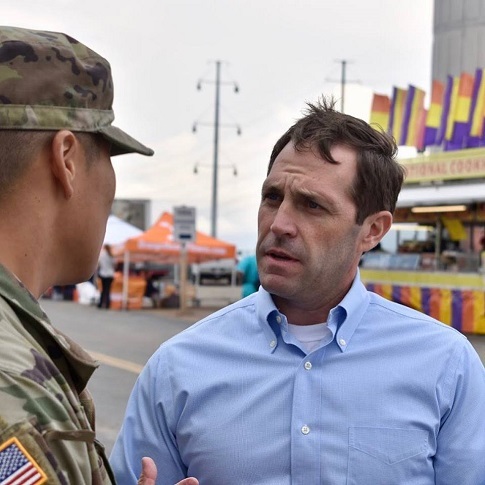 Jason Crow, who is challenging incumbent Republican Rep. Mike Coffman (Colo.), also represented a contractor who defrauded a veterans hospital of up to $2 million. The minutes show that Crow missed 18 out of 51 meetings of the Colorado Board of Veterans Affairs while he served on it between 2009 and 2014. Gov. John Hickenlooper (D.) reappointed Crow to a four-year term on the board in 2013, but he was no longer a member as of May 2014. In June 2014, the Aurora Sentinel reported that "simmering scandals finally boiled over in May when major problems within VA medical care were confirmed by the release of a departmental audit June 9. The report, which detailed thousands of veterans on waiting lists for months, was the latest news for a battered system under fire for mismanaged facilities and care." The audit revealed that more than 1,600 new patients had to wait at least 90 days for appointments at eastern Colorado VA medical centers, as well as 115 patients at western Colorado VA hospitals. "Locally," the report continued, "the VA has been the target of relentless criticism on how it's handling a replacement VA hospital being built in Aurora. The project is hundreds of millions of dollars over budget and the target of federal scrutiny." After years of delays, the VA hospital in Aurora opened earlier this year, $1 billion over budget. According to a USA Today report from 2014, an investigation found that "clerks at the Department of Veterans Affairs clinic in Fort Collins were instructed last year how to falsify appointment records so it appeared the small staff of doctors was seeing patients within the agency's goal of 14 days." "Many of the 6,300 veterans treated at the outpatient clinic waited months to be seen," the report continued. "If the clerical staff allowed records to reflect that veterans waited longer than 14 days, they were punished by being placed on a ‘bad boy list.'" Eric Shinseki, then-secretary of Veterans Affairs, resigned in May 2014, "apologizing for a scandal in which employees throughout the VA’s massive hospital system conspired to hide months-long wait times that veterans faced when seeking care," according to a Washington Post report. Crow touts his work on behalf of veterans on his campaign website, noting that he "chaired the statewide veterans committee that led the charge to bring the Denver Veterans Medical Center to Aurora." He spoke similarly of his work on the state board of veterans affairs in a video posted on Twitter last year. In March 2013, Crow began representing Jonathan Saunders, who was charged with fraud over a $2 million agreement for work at a Texas hospital. Saunders faced six counts of wire fraud and two counts of aggravated identity theft. Court documents show Crow’s services were terminated in April 2013. According to the Associated Press, the indictment "involves qualifications for projects at a VA campus in Kerrville, about 60 miles northwest of San Antonio. Prosecutors said Saunders falsely said his company qualified as a service-disabled, veteran-owned small business and used certain people’s names without their permission." Saunders pleaded guilty to one count of wire fraud in January 2015. "By pleading guilty, Saunders admitted that over a period of five years beginning in March 2008, he knowingly provided fraudulent information to the VA in order to obtain up to $2 million in task orders from the VA for projects to be performed in and around San Antonio," according to a Department of Justice press release. Saunders was sentenced to one year and one day in federal prison and ordered to pay $1,494,000 in restitution for defrauding the Department of Veterans Administration. A new ad from the Congressional Leadership Fund attacks Crow’s record with veterans. "While veterans suffered from the VA scandal," says a Colorado veteran, "Crow didn’t show up for work. Worse, as a trial lawyer, Crow represented a corporate executive who stole millions from a veterans’ hospital." This entry was posted in Issues and tagged 2018 Election, Colorado, Veterans Affairs. Bookmark the permalink.